The Supreme Court decision known as SWANCC (Solid Waste Agency of Northern Cook County) in 2001 has prompted a complex debate over the jurisdictional areas that are protected under the federal Clean Water Act (CWA). ASWM has published a number of papers that provide analysis on "Waters After SWANCC" and related discussion topics. In addition, ASWM has posted discussion papers and legal analysis provided by its partners. 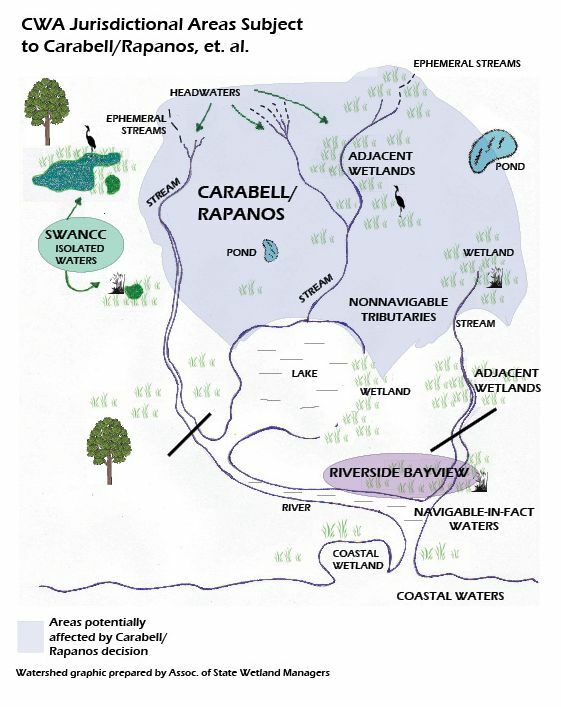 The graphic at right shows the areas that are potentially affected by the Supreme Court decisions: Rapanos, SWANCC and Riverside Bayview. This paper was prepared to facilitate discussion in a 2005 workshop concerning the identification of "waters of the U.S." for Section 404 wetland permitting and the role the states may play in closing the "gap" in federal Section 404 regulations created by the SWANCC decision. It focuses upon the identification of "waters of the U.S." What did the U.S. Supreme Court hold in SWANCC concerning that identification? What are some of the major legal issues and field identification problems in identifying such waters? What have lower federal district and courts of appeals had to say with regard to Clean Water Act jurisdictional issues in both pre- and post- SWANCC contexts? This paper has been written primarily for lawyers and, therefore, contains many case citations. However, it may also be of interest to federal, state, and local regulatory agency staff, planners, and others who work with the Clean Water Act. This document is only available in PDF format and may be viewed and/or downloaded by clicking HERE. This document, laid down in 2001 and updated in 2004, discusses the SWANCC decision and the gap it created in the regulation of wetlands. It examines administrative actions to interpret SWANCC by the Corps of Engineers as well as the EPA. This is followed by a description of federal district and appellate court decisions concerning the scope of Section 404 waters since SWANCC. It considers existing state regulations and regulations adopted by the states to fill the gap created by SWANCC. It concludes with a discussion of options for filling that same gap. The document is only available in PDF format and may be viewed and/or downloaded by clicking HERE. Prepared by Pat Parenteau – Professor of Law – Vermont Law School. The SWANCC decision in January of 2001 sent the Section 404 Regulatory Program into turmoil. ASWM and ASFM bore witness to increasingly varying interpretations of the program's jurisdictional scope in the wake of the Court's invalidation of the "Migratory Bird Rule" as the sole basis for federal regulation of non-navigable, isolated, and intrastate wetlands. This document attempts to address this untenable situation of ad-hoc policy. The full document is only available in PDF and may be viewed and/or downloaded by clicking HERE. This memorandum was prepared to help states understand and respond to the SWANCC decision. It may be distributed or quoted with credit. A draft of the memorandum was distributed to thirty states. The comments and suggestions of state staff and others pertaining to the draft which were submitted to us are much appreciated. We welcome any further comments, corrections, improved estimates of “isolated” wetland acreage, or copies of proposed or adopted state or local statutes, rules, or regulations to address isolated wetlands. The full document is only available in PDF format and may be viewed and/or downloaded by clicking HERE. This 2006 guide was written to help States and others understand the Solid Waste Agency of Northern Cook County v. United States Army Corps of Engineers (531 U.S. 159, 2001) decision by the U.S. Supreme Court. We welcome any further comments, corrections, improved estimates of "isolated" wetland acreage, and copies of proposed or adopted state and local statutes and regulations which address "isolated" wetlands. The full document is only available in PDF form and may be viewed or downloaded by clicking HERE.